I'm off to a friends place for morning tea tomorrow and this is what I'll be taking (but I did make extra so that hubby can't grizzle about missing out this time). Someone mentioned in my Chocolate Truffles post that they would love a recipe for Chocolate Truffles without chocolate in them... how about these? Warm unopened tin of condensed milk in bowl of warm water. Sift icing sugar into large bowl and add coconut. Stir in condensed milk and mix until mixture is fully mixed. Divide mixture in half into separate bowls (sometimes I don't bother and just add the vanilla and make mine all white). In one bowl add a few drops of vanilla essence and mix well. In the other bowl add the food colouring and raspberry essence and mix well (it's quite nice to add peppermint essence with green food colouring instead). 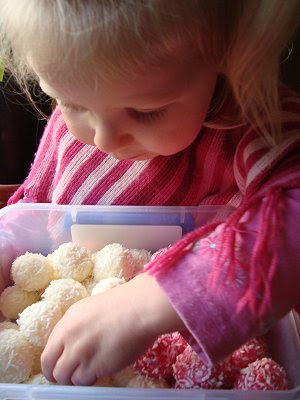 Either roll mixtures into small balls and set in fridge, or press one bowl of mixture into a pan dusted with icing sugar and then press the other mixture on top, then set in fridge. Cut when set and store in an airtight container. Enjoy... but don't eat too much as it can be rather sickly! :: If you hadn't already noticed, in the top right hand corner of my blog there is a 'search' space... so if you are looking for a particular post or recipe, try searching there. Yum, I love the photos! yummo! 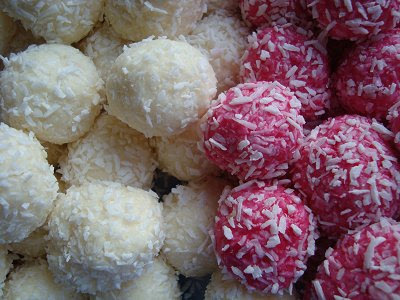 anything made with condensed milk and rolled in coconut is my fave. I made lolly cake today which I love. wanna swap a piece for that coconut ice??? Oh the hunger pangs! But, after stepping on the scales this morning i shouldnt' even look! they look yummy! 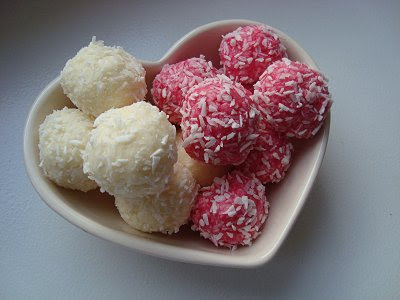 If my husbands sees this He'll force me to make them - he loves coconut! Yikes! You just whizzed me back twenty years to afternoon tea at my Nana's house! wow these look awesome and sooo tasty! I love coconut anything! The photos are great by the way! You said they need to be stored in an air tight container. Just checking they don't need to be kept in the fridge then? Any idea how long they would keep for? I am thinking about making them in advance for a party (of course the hardest bit will be controlling myself not to eat them all before the party).